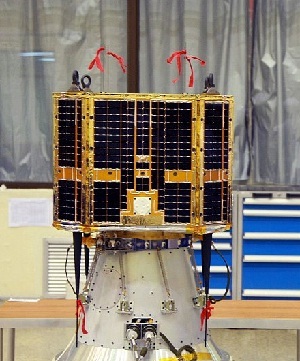 On 15 Dec 2009, AMSAT China launched a new amateur radio satellite, now designated as Hope Oscar (HO) 68. This satellite not only has a V/U FM repeater but also a V/U linear transponder for SSB and CW as well as a packet BBS system. This one should be great fun to work. A physical experiment is based on an idea of school children and is concerned with the movement of particles in the space under nearly weightless conditions. For this we observe the behavior of a, consisting of 5 different colors of granules in orbit. To take panoramic pictures of the Earth is another mission objective. This CMOS uses a wide angle color camera with a resolution of 1.4km/pixel. The Amateur Radio payload of XW-1 consists of a CW telemetry beacon, a linear transponder, an FM transponder and a store and forward packet radio mailbox. The current situation is that the transponders will be difficult to switch the RF PA from beacon mode to transponder mode. The RF relay or its drive circuit is failing, it is a stick relay. Probability of success of switch is probably a few tenth. On the other hand, up to now the both solar and lithium-ion batteries are in very nice condition. The exhibitions of the thermal-control, onboard flight computer and TT&C are also excellent. The beacon is always on and transmitting at a power of about 200mW. In 40 seconds, a complete set of telemetry data at about 15 wpm is sent, followed by 10 seconds rest.